A popular starting point from which to explore Asia, North America and even Australia, cruises from Singapore depart from this ideal destination year round. Offering a modern, purpose-built terminal on Maritime Square in the Harbourfront district, cruises from Singapore depart from the world’s ninth largest cruise port, Singapore Cruise Centre, just 7km from the CBD and 24km from Changi International Airport. Singapore’s Harbourfront passenger terminal is situated in the Berkit Merah zone and is easily accessed by car, taxi and train. The Harbourfront Singapore Cruise Centre features an excellent range of portside facilities including duty free shopping, fashion and a wide range of dining options. There are also onsite tour booking services and currency exchanging facilities and Singapore’s largest shopping centre, Vivo City, is also nearby. Cruises from Singapore are a wonderful way to extend your holiday and spend a bit of time in this stunning city before continuing on with your cruise holiday. There are a number of attractions close to the cruise terminal as well as a few others a little further out that are worth exploring. From beautiful beaches to exotic wildlife and tranquil gardens, authentic local cuisine, fascinating history and shopping beyond your wildest dreams, Singapore’s got something for everyone. Shop til you drop at the famous malls of the Marina Bay, Orchard Road and Bugis. Ideal for swimming, getting active in the water or just relaxing on the sand, the beautiful beaches of Sentosa Island are located on the east coast of the country and are some of the best in Singapore. Ride the cable car to Sentosa Island and explore gardens, golf courses, the aquarium, live stage shows, theme parks and all the family fun of this man-made island. Nicknamed the ‘Garden City’, Singapore enjoys a beautiful range of inner-city parks and gardens. Don’t miss Southern Ridges HortPark, amazing Cloud Forest, National Orchid Garden, Botanical Gardens and the incredible Flower Dome in the Gardens by the Bay. Get up close and personal with the local wildlife at the Singapore Zoo and Jurong Bird Park. A unique blend of Chinese, Malaysian and Indian ethnicities, a large part of Singapore’s culture is dominated by food and with so many ethnic influences you’re in for a treat. 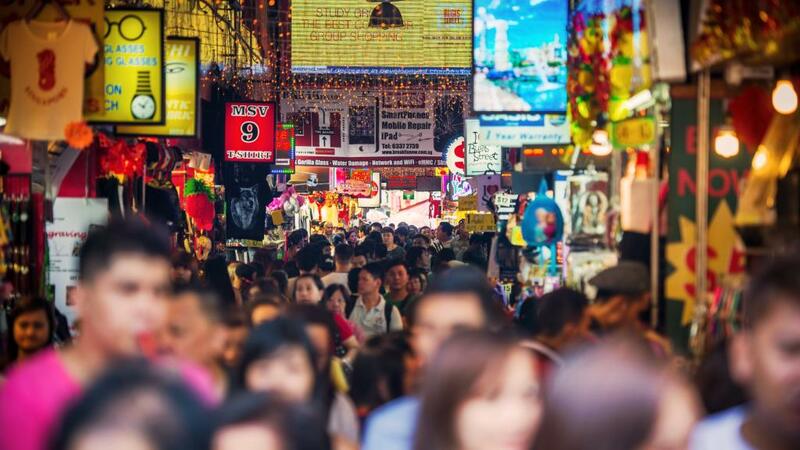 Discover the melting pot of cuisine and explore Arab St, Chinatown and Little India for a selection of traditional dishes and sample everything from fresh seafood to Middle Eastern and Malaysian fare. Singapore’s colonial past plays a significant role in the its rich history and there are plenty of museums and historical buildings that provide an interesting insight into old Singapore. The variety of ethnicities embodied in Singapore also represent a wide variety of faiths, which means a range of places of worship which are interesting to explore. Some of the top places to see include Kong Meng San Phor Kark See Monastery, Masjid Sultan, Burmese Buddhist Temple and Thian Hock Keng temple, Singapore’s oldest hokkien temple.